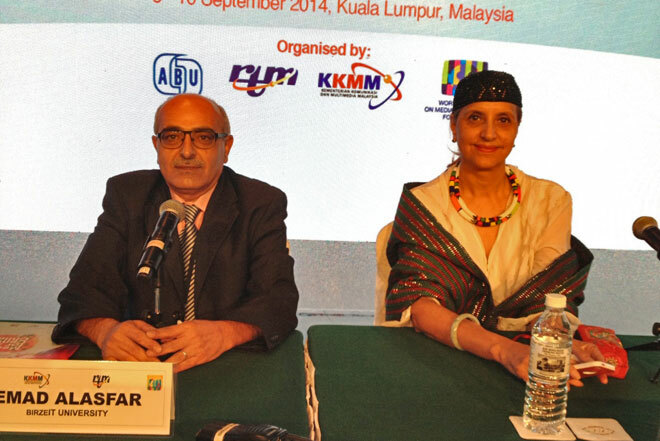 As a representative of the Arab States Broadcasting Union, Birzeit University Media Development Center participated in the "Seventh World Summit on Media for Children," held by the Asia-Pacific Broadcasting Union in the Malaysian capital Kuala Lumpur from September 8-10, 2014. Media Center representative at the summit, Imad Al-Asfar, gave a presentation on the reality of media coverage of children's issues during the recent Israeli aggression on the Gaza Strip, recommending that the media role of concerned international organizations be activated, and that journalists be trained to take into account the provisions of international humanitarian law and human rights in their media coverage. Al-Asfar’s presentation was greatly appreciated by Summit organizers, who promised promised to include the Palestinian recommendations in the Final Universal Declaration to be issued by the summit.